First put some olive oil in a smallish pan. The amount depends on how big your pan is and how big you’re making your omelette. For mine, I add about 2 or 3 Tbsp. 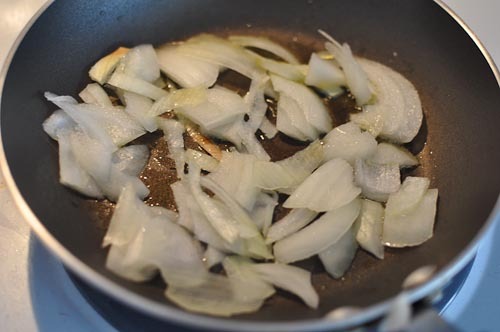 I prefer to put more than some people because I find that the onions become nice and softly fried rather than burnt if you were to use olive oil spray or something like that. Also, a lot of the oil evaporates (I think) so you’re not left with eating a whole bunch of fat. And even if it doesn’t, olive oil is a HEALTHY fat! A kind of fat your body loves 🙂 Turn the pan on medium heat. Chop onions and throw them into the pan once the oil has gotten pretty warm/hot. 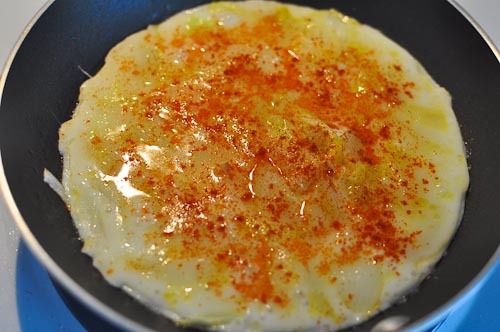 Make sure to stir them up once or twice so that both sides are fried rather than burning one side. 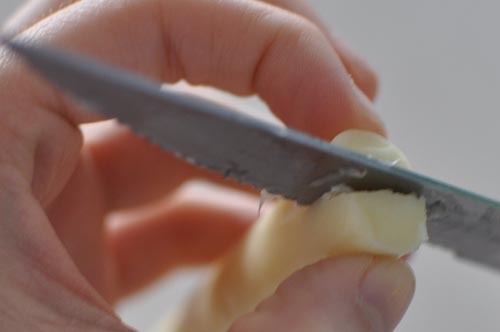 Meanwhile, take your string cheese and cut it in half with a knife. 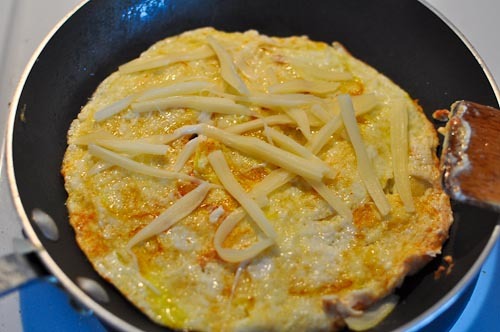 You can also use the whole stick if you like your omelette more cheesy. I like to keep my calories as low as possible so that I am able to eat more throughout the day and spend more of my calorie allowance on, say, dinner or dessert. 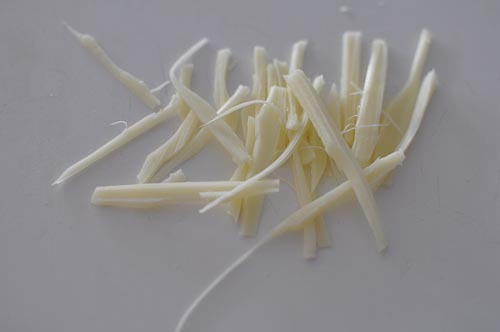 Take the part of string cheese you’re going to use and string it up. Save the rest in a small ziplock bag so it doesn’t dry up in the fridge. 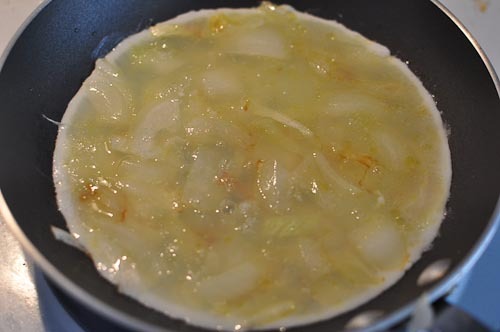 By now, the onions should be nice and soft and ready for you to pour the liquid egg whites in. I use about 1/4 of the package. 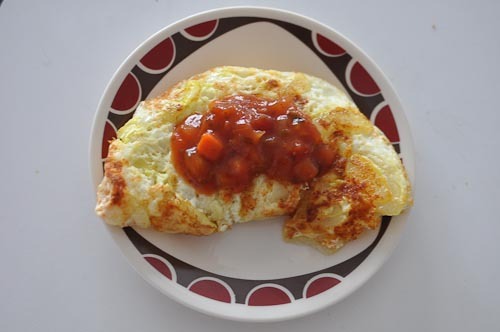 Once the one side is cooked a little bit, put a bunch of cayenne pepper on the omelette. Cayenne pepper is a wonderful spice and it boosts your metabolism. Plus it gives your meal a little bit of a nice kick (it’s not too spicy though, no worries). Amount you put depends on how spicy you like it. 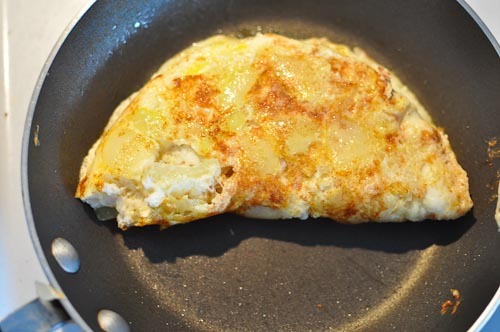 Wait for the one side to cook nicely, then flip the eggs over to cook the other side. While it’s flipped on the other side, add the cheese pieces on top. Cook it for a little bit longer, checking the bottom to see when it’s fully cooked the way you like it. Then flip the one side over the other and cook for a bit longer to ensure it’s cooked exactly the way you like them. 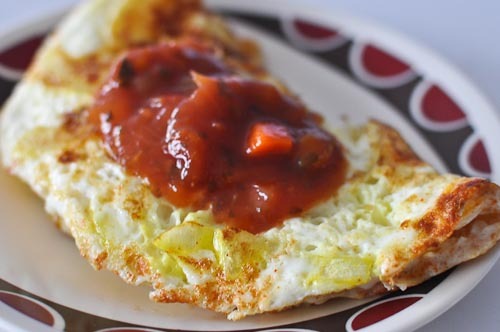 Add some salsa on top and you’re done! Deliciousness. Calories depend on the products you use, but they will be very easy to calculate! Thank you! Caramelized anything is always a good way to go =) Thank you for stopping by! 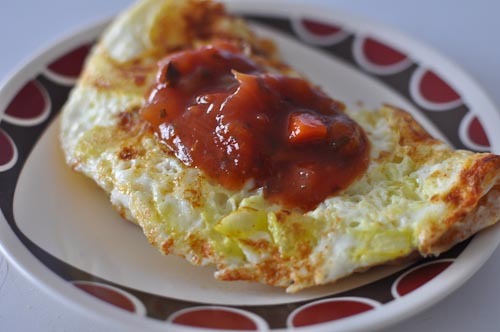 I love omelettes! My husband and I eat them for breakfast on the weekends pretty often. I never thought about adding cayenne pepper though, that’s a great idea! Pingback: Wordpress Recipe Plugins for Food Bloggers: Recipage Vs ZipList – Which is better?